Insights: Does Nigeria need a N5000 note? Does Nigeria need a N5000 note? The announcement by the Central Bank of Nigeria (CBN) to introduce N5, 000.00 notes and coin the lower denominations of N5, N10, and N20 has received a lot of criticism from the Nigerian public already. The criticism has mainly revolved around the fear that the higher note will cause inflation. The CBN has however argued that there is no evidence that higher denomination can cause inflation, arguing that inflation is caused by increase in the volume of money in circulation rather than by the denomination of the money in circulation. What I am going to do in this opinion piece is to look critically at the CBN argument. Would the new CBN denomination policy cause price increase in commodities and services in Nigeria? First, as argued by the CBN, Nigeria would not be the first to coin lower currency denominations. The CBN is proposing to coin the N5, N10 and N20 and introduce N5000.00 notes. Denmark has coins in the same range as being proposed by the CBN, while Japan and South Korea have coins in the range of 50, 100 and 500. Japan and South Korea also have a 5000 and 10,000 note. So it could be argued that the CBN is not doing something that has not been done in some other part of the world. The difference however is that these countries also have very advanced cashless payment systems so these notes are hardly ever seen physically. So are Nigerians right in being apprehensive about the introduction of N5, N10 and N20 coins? 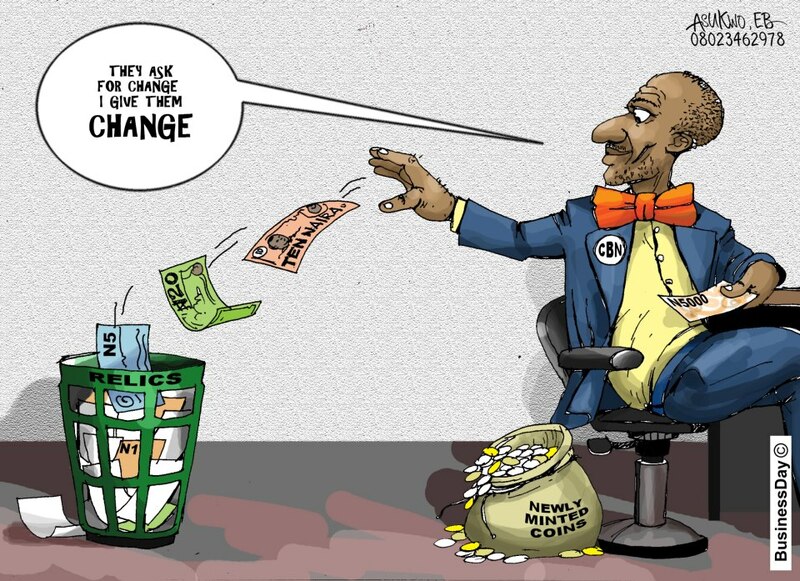 If the characteristics of a good payment system are taken into consideration, then Nigerians have every reason to fear that the coinage of the lower denominations would be inflationary. A good payment system is expected to be efficient, convenient and low cost for the users of that payment system. Would coining N5, N10 and N20 be efficient, convenient and low cost for Nigerians? The answer is most likely no. As the CBN admitted during the introduction of its cashless policy, 90% of banking transactions are below N150, 000.00 and that Nigeria is largely cash oriented society unlike Denmark and Japan or South Korea. This is largely true as most transactions in Nigeria are carried out in the informal market, where a good proportion of individual transactions are done under N1000.00 in the open market. Most market women hold huge amount of money in porches tied around their waist, from where they dish out money for items or as “change” for purchased items. Coining the N5, N10, N20 notes would mean that these women would no longer find it convenient to hold these monies in the way they are used to holding it for ages. This will affect the millions of informal market women who will suddenly find that holding this amount of money is no longer convenient. These informal market participants would be forced to adopt the next higher currency note, N50 in order to restore the convenience that has been denied them with the lower coins. This would lead to price increases. No amount of education as planned by the CBN would make Nigerians adopt the massive use of these coins because it is inconvenient, the informal market is huge and significant amount of transactions still take place with these lower end currencies. Coins are meant for low value transactions so where higher currency values are forced into this bracket, the most likely result will be avoidance of transactions that would create the inconvenience of using coins. There is also the strong argument of the higher denomination being against the cashless policy of the CBN. Higher denominations would encourage users to demand it for higher value transactions. It is however possible that the high cost of transactions for cash withdrawal by the CBN may discourage this trend. So the question is, why is the CBN introducing a higher denomination currency if there are already policies in place to discourage its use? The argument that it would lower cash processing cost by banks is also lame since the cost of printing and processing coins is far higher than that of notes. The implication is that the CBN will spend more to introduce a set of currency with low demand. That would amount to waste of funds and increase cost and inconvenience for banks. Perhaps, the most important issue that the CBN would have to deal with when it introduces the N5, 000.00 notes will be counterfeiting. In a largely informal economy like Nigeria, it would not be surprising if the N5, 000.00 note becomes the counterfeiters gold. There is a real possibility that the N5, 000.00 notes are counterfeited and circulated widely in the informal economy since the cost of counterfeiting would be less than the value that would be derived from circulating the fake currency. The whole idea of the CBN currency restructuring exercise is against its own cashless policy which it has pursued vigorously since the beginning of the year. It would have made more sense if the CBN had continued to fine tune the cashless policy, make it more acceptable and workable, as that is the global trend, than derail its own policy with its latest initiative. First and foremost, how much that evil, called Corruption is embedded in the structural DNA of the reference countries ? The problem is that Nigeria Nation Managers wallow in reference to just the aspect that favours their intention rather than a wholesome consideration. What are the inflation levels in those countries referenced? What are indices of commodities prices, and the control of the same ? How much infrastructural provisioning is being made available, and the level of efficiency and reliability of the same ? The Managers of Nigerian Economy don't always take a wholesome consideration of the larger percentage of the population who live in poverty. That's where the problem lies. As I always want to assert, as long as there is a Total Lack of Honesty of Purpose, all is in vain...sadly.